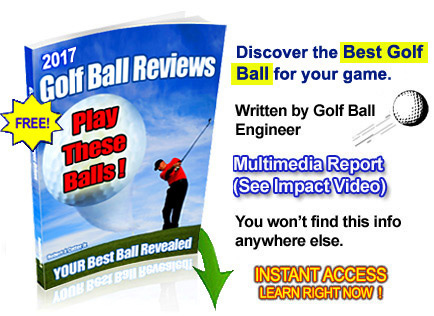 Golf Ball Reviews, Ratings, and Comparisons are of little value to the serious golfer. Why? 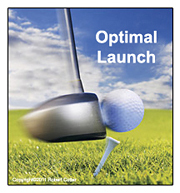 Because they do not factor in your personal equipment parameters, launch conditions, and swing type. Are you confused by the vast array of golf balls available today? I don't blame you a bit. If you read the magazines or tune into the weekend golf broadcasts, it seems every few months there is the newest and greatest golf ball coming out onto the market. Every company seems to have the Best Golf Ball! According to the advertising, this new "breakthrough ball" or family of balls will have you hitting the longest, straightest shots, and stopping the ball on a dime right by the flag! Is there really a difference between golf balls or are they all the same? What is the longest ball I can use in 2018? Are expensive balls better than cheap balls? What's the difference between 2, 3, 4, and 5 piece balls? Did you see those golf ball reviews and brand comparisons in that golf magazine. Are they true? What's a good golf ball for seniors? What's the best dimple pattern? It's a jungle out there with all those different constructions, cover materials, mantle layers, mind boggling dimple patterns, etc... and the well intended golfer can easily get confused. And what about those confusing golf ball ratings, reviews, or comparisons you see from time to time in the magazines or on the internet? For golf ball ratings to be fair and accurate, each ball must be hit under identical conditions with "Iron Byron" type mechanical golfers, and most importantly, with identical equipment parameters (driver loft, swing speed, shaft flex, etc...). The optimal or longest ball for the mechanical golfer... Not for You!!! Unless your swing type, equipment, and launch conditions are the same as the machine's (very unlikely), then those test results are of little value to you and your game. 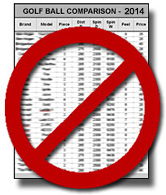 The Pro's don't use these sponsored ball ratings, so why should you? As a US Patent Award winning golf ball engineer , I've worked knee deep in golf ball technology for years, developing new ball designs, and then matching the finished product to the correct recreational and professional golfers based on their personal needs and equipment parameters. I have outlined some of this experience here http://www.instantgolflessons.com/. The correct ball works in unison with every golfer. Take any top player. There is a best ball for their particular ball attack angle, swing speed, side spin, and more. In fact, I even witnessed a major championship winner add ~20 yards to his drives after the correct ball was matched to his equipment and launch conditions. Imagine that... a golfer at the highest level of the sport taking his game up a notch with the right information. The Average Golfer Swings their Driver at ~90 mph. That's you if you're ~60 years old, have a little pot belly, maybe some arthritis in the knee, love the game, want to beat your buddies, and are about to start playing more now that you are retiring. Now you may be 14 or 87, but you get the idea. The "average Joe" can swing that big driver club head at that speed. That's a fact. So what's so great about 90 mph club head speed? 90 mph is enough club head speed to launch the ball 250 yards or more! Sadly, the average golfer can't reach or surpass that driver distance because they don't understand (through no fault of their own) my 3 step formula for maximum distance. spring effect of today's driver faces. (they are literally like a trampoline)! even close on this one). Most importantly, you must be using the Correct Golf Ball for your swing speed, equipment, and shot pattern. Unfortunately, virtually every golfer I have worked with is way off the mark. In fact, the longest ball for a given real world golfer may not be the longest ball for another golfer. It may even be the shortest! It's frustrating to meet so many golfers who are not using the right ball type due to no fault of their own. In many cases, they are getting the wrong information. What's worse, they often end up playing "whatever they find in their bag" (or the woods). And here is a typical result. Look at the chart below. The same golfer, three different ball types. Note the three flight patterns. Yet every PGA or LPGA pro is in the Green Zone because their ball is matched to their specific swing type, swing speed, equipment, and strengths/weaknesses. The fact is their livelihood depends on it. Due to their status, the pros have the opportunity to work directly with the golf ball companies and ball design engineers like myself to get a personalized game analysis and ball fitting. For example, take the Jason Day Golf Swing, it has been matched to the best ball for his game. The average golfer just doesn't have access to the field tests, launch monitors, professional fittings, and unlimited ball types for experimentation. You can't go to your local practice range and demo golf balls! It is extremely critical that the serious golfer understands that the best performing golf ball for you also depends on specific factors including driver loft, shaft flex, swing type (slow, fast, etc...), shot type (fade, draw), and several other factors. In fact, most of the other variables that affect your distance and accuracy just aren't public knowledge because they aren't written about in the magazines or talked about during the broadcasts. They are the domain of people who work in the golf ball industry. Like the old saying, the "devil is in the details". However the best golf ball for YOU, combined with solid impact, and the right launch angle can literally transform your game immediately by adding 10, 20, even 30 yards to your drives. Do I sound passionate about using the right golf ball? You bet I am. Here's how you can take advantage of my expertise in your own game. After years of working with golfers from Major Championship winners to beginners, I developed a proprietary Golf Ball/Golfer Matching System. I will match your individual equipment and personal game details with the correct ball that will maximize your distance, control, and playability. For the last 22+ years (over 11 years online), I have made golf ball recommendations for hundreds of golfers all over the world. "265-270 yds. every drive! " "Robert, I can't thank you enough for your help! I just got a dozen RB's, they are AMAZING! I have been hitting the ball 265-270 yds. every drive! They are also more durable than the PB's I was playing with. I just shot a 83, my best round ever. "hit more greens... longer distance"
... I hit more greens with the RB than the PB, so I have been playing for the last month with the RB and playing more consistently with longer distance. Thanks again for your suggestion of the RB and hope you are having a good Spring. Now I could fill this page with testimonials, but I am more interested in emphasizing the importance of proper golf ball selection to your golf scores and satisfaction from the game. It doesn't matter whether you are a male or female golfer, and are trying to break 120 or 70. In fact, professional golfers rely on ball fitting to maximize distance with their individual golf swings. The cumulative effects of another 10-15 yards off the tee over the course of a 4 day tournament can mean the difference between winning, and a top 50 finish. There is a right golf ball for you to that can increase your distance, and reduce the ill effects of your bad shots (slices, hooks, etc...). This translates directly to lower scores on YOUR score cards. So let me ask you, does an 84 sound better than a 91? How about 96 vs. 105, or a 67 compared to 71?! These are the types of results my clients experience. If fact you may have teed it up against a few of them without knowing. 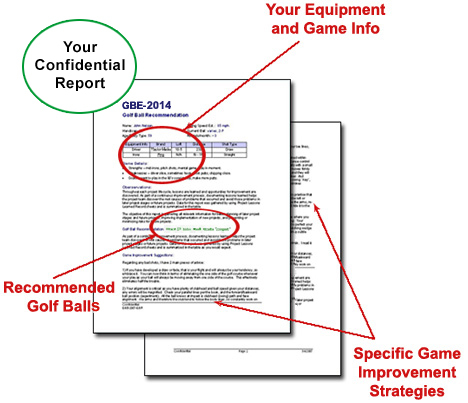 Here's how to take advantage of my expertise and receive an Individualized Golf Ball Report specific to you, your game details, and equipment. First I need some information from you like your handicap, years playing, problem shots, equipment info (my complete, concise questionnaire is provided once you decide to get started). Note: If you are new to the game or don't have all the answers, that's fine. Just provide as much info as possible. This will benefit beginners as much as the mid handicap and highly skilled players. In <48 hours you will receive a detailed report with several specific golf ball recommendations (company and model), as well as why they are a great choice for your game. But that's not all. Remember point 2 above about the correct ball launch angle? I am also going to give you my recommendation for you and exactly how to achieve it. Note: You may not understand what this means now but I will explain all that in your report. That "banana slice", hook, or push/pull. Those annoying topped or "fat" shots. Getting out of the bunkers. I Guarantee you will find your Confidential Report Eye Opening. Bonuses: Now, here is where it gets even better. I am going to include 2 limited time, special gifts. I am going to give you a copy of my best selling book, "The Key To A Repeating Golf Swing" (sold elsewhere by itself for $47). This is the new, 7th edition of my breakthrough golf swing system. Over 10,000 golfers in 61 countries have put my simple, proven swing system to the test and the results have been astounding. I am going to show you the swing method I developed after working with top professionals. All great players, past and present, male and female, are performing The Key whether they are consciously aware of it or not. And the experience is the same for Men, Women, and Junior golfers, whether they are picking up a club for the first time after 40, or trying to shave off those last few strokes to break 70. You will love what it does for your game. After you have crushed the right golf ball down the fairway, and ripped an iron into the green, I want to help you make that putt. 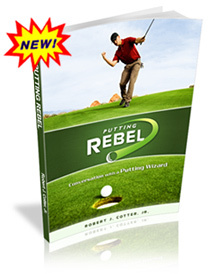 So for a very limited time, I have also decided to offer you a copy of "Putting Rebel - Conversation with a Putting Wizard"
Putting Rebel is based on a facinating dicussion I had with the best putter I have seen in all my years playing golf. Inside you will learn the exact technique and strategy that Jay, the Putting Rebel, uses to average less than 29 putts per round. Jay sees the big picture on the greens beyond the break and speed, and buries the ball in the hole like it is being pulled by a string. He is an absolute savant with the flat stick in his hands. You will learn from the best. It is truly fascinating instruction that will help your putting game instantly. Now then, I get paid a LOT of money for consulting. There is an incredible demand for my golf ball knowledge because there are just a handful of individuals with my background in the golf industry. I have worked to keep this service affordable so every serious golfer would have access to a personalized golf ball recommendation. Remember, this is an individualized report, not some canned one-size-fits-all recommendation. So it takes a good bit of my time, but it's time well spent as I am determined to get this unique information in to the hands of as many golfers as possible in the 2017 season. Whether you tell your golfing buddies or keep your new weapon a secret is up to you. 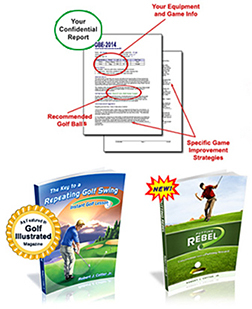 Your personal Golf Ball Recommendation Report plus the Brand New, Professionally Illustrated editions of "The Key To A Repeating Golf Swing" and "Putting Rebel" (standard PDF format for PC and MAC computers, tablets, smart phones, etc.. - Immediate, Simple Download) or have the Hardcopy Version delivered to your doorstep! Put my Personalized Golf Ball Recommendation and Game Improvement Package to the test. Then, if you honestly feel you haven't experienced game improvement results from my expertise, email me within 45 days of purchase and I will issue you a prompt, courteous refund of your purchase price. Hardcopy product must be returned in original, new condition for full product price refund minus original shipping. have the Hardcopy Package delivered right to your door step (Worldwide Shipping, same price)!. Yes Robert! I'd like Instant Access to the 2 ebooks (simple download) and my custom Ball Rec Report by email. Yes Robert! 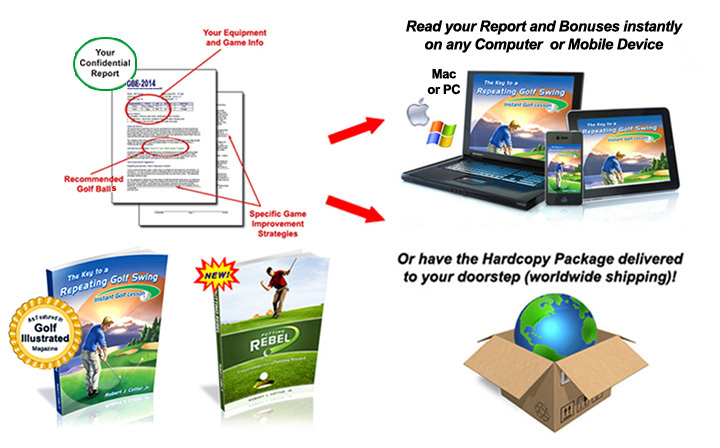 I'd like the new 130 page Hardcopy Manual delivered to my door step plus my custom Ball Rec Report by email. Important: This New Edition Package Price is a Limited Time Players Championship Special Offer. 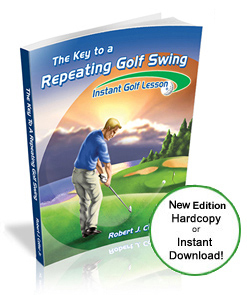 Take advantage of this incredible offer and receive your complete 3 part package including FREE lifetime “The Key To A Repeating Golf Swing” manual updates. You'll also be receiving your unbiased Golf Ball Recommendation Report from a US Patent Award Winning Golf Ball Engineer with this special customer offer.